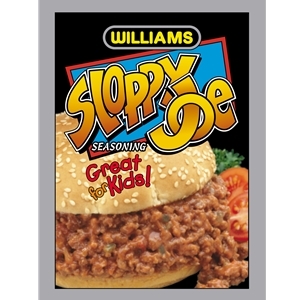 Williams Sloppy Joe Seasoning Mix is rich tomato taste that kids and adults both enjoy, yet simple and easy to prepare. Time savers that are flavor filled! Turn typical everyday dishes into surprising family feasts. 1. Brown beef or turkey, drain fat. 2. Stir in seasoning mix, tomato paste and water. Sugar, wheat flour, salt, dehydrated onion, spice and coloring, dextrose, autolyzed yeast extract, citric acid, beet powder, maltodextrin, natural flavors, disodium inosinate, silicon dioxide (anti-cake).